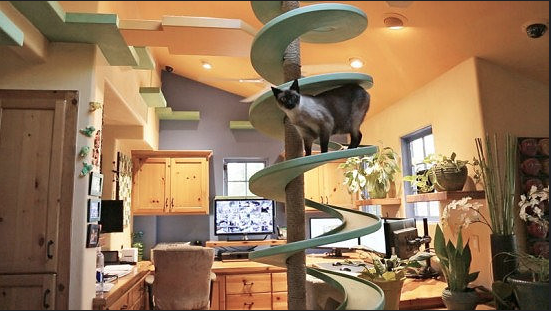 Would you transform your home for 22 rescue cats? When we think of crazy cat ladies, we envision a woman with messy hair, wearing big clothing and living with six plus cats. 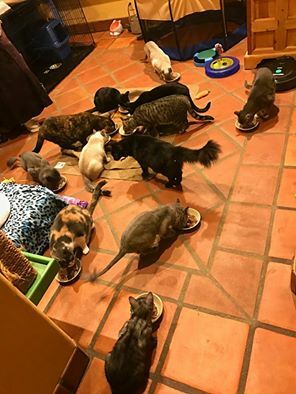 Now, what would you imagine if you hear about a man that lives in California with 22 rescue cats? Peter Cohen shares his gorgeous home in Santa Barbara with 22 rescue cats. These cats all have very unique, yet adorable names: MiniBean, Smokey, Vanilla, Mango, The Professor, Mikan, Climber, Blackbird, Jupiter Jones, Smudge, Nugget, Nutter, Butter, Crumple, Rumple, Cookie Monster, Secret, CoffeeBean, Donut, Cheesecake, Chocolate and Poppyseed. Whew, what a mouth full. Just check out what feeding time looks like! After he bought his home in the late eighties, he had two cats that unfortunately got hit by a car. After that, he decided he wanted to keep all of his cats indoors. This sparked his inspiration of transforming his home. Unfortunately after his cat Peanut passed away from FIP (Feline Infectious Peritonitis), he adopted Miss Bean who was then diagnosed with FIP as well. Cohen contacted the researchers of this disease at the University of California, Davis, and he found a drug to try. Miss Bean sadly didn’t make it. Cohen then purposely adopted a FIP kitten (Smokey) to put into the research trial. I’m happy to report that Smokey is doing well. 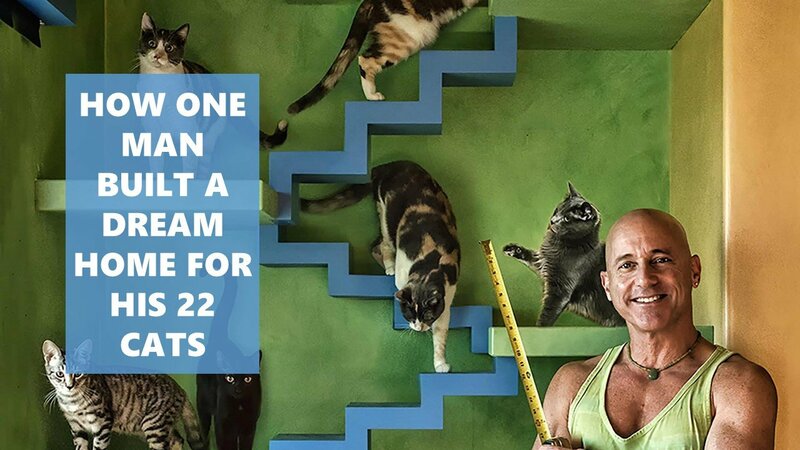 Cohen had started with two cats and ended up with 22 and counting. It’s one thing when you adopt a few dogs or cats and make your spare room a hang out area for them. 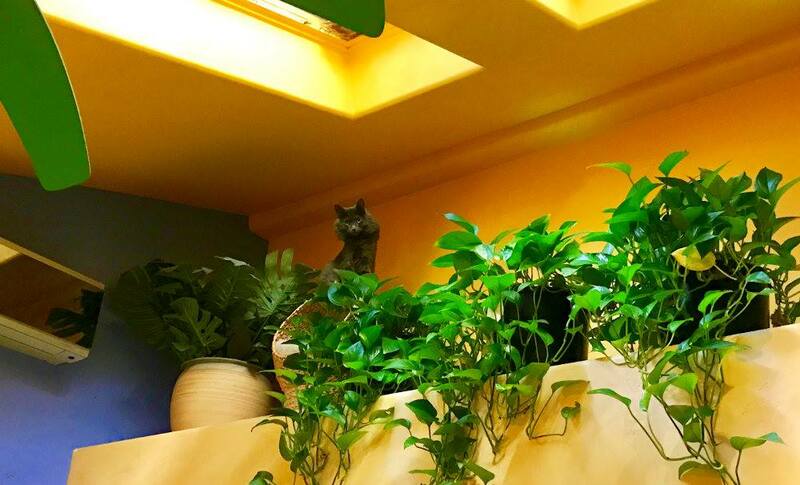 It’s another thing when you transform your entire house for these four-legged animals. It’s nice to see people being a little selfless these days. Animals don’t have voices. We have to stick up for them and help them live good lives. After all, they live fairly short ones. I’m happy to see Cohen taking such good care of so many cats and kittens that need help. It’s even more impressive to see that he’s using his fame from this to find a cure for FIP, along with participating in humane journeys. Thank you Peter Cohen! Amy has a BA in professional new media writing and is in the process of trying to find her dream job while still attending concerts and having the time of her life.